At the 2018 Regional Economic Development Council (REDC) awards last month, the Capital Region received $67 million for 95 projects. Those REDC awards included funding for 20 Capital Regional Economic Development Council-designated “priority projects” totaling $14.3 million and three regionally significant projects totaling $1.8 million. Over the summer and fall, CEG assisted the CREDC in preparing its 2018 Progress Report, which details the state of the region and status of past priority projects. The 165-page report also details the Council’s proposed priority projects and is evaluated by a Strategic Implementation Assessment Team (SIA). One of the CREDC priority projects that was awarded funding at the REDC Awards was the Hudson Valley GamerCon, a project proposed by CEG, the Albany Capital Center (ACC), Eastern College Athletic Conference (ECAC) and Metro Atlantic Athletic Conference (MAAC). The HV GamerCon, which will be the Northeast’s largest collegiate esports event on March 30 and 31, received $152,000. It will feature a dozen collegiate teams that will compete in tournaments in League of Legends, Overwatch and Fortnite. HV GamerCon will be held at the Albany Capital Center and also feature a Gaming Exo with vendors and exhibitors from the Capital Region’s video game development hub. CEG has launched a Veteran Connect Center (VCC) initiative. AAA Hudson Valley became the VCC’s first contributor with a $5,000 check for the VCC. Other early contributors include the BBL Foundation and GLOBALFOUNDRIES. Across all military branches and worldwide, the VCC will market the Capital Region to transitioning service members and their families and connect them to local career, educational and community resources. The VCC will also connect veterans already in the region with the educational, career and community support services they need. Additionally, the VCC will provide programming and information to local businesses and institutions interested in hiring, educating and supporting veterans. We aim to have the VCC operational by April 1. Continued to follow up with our local Ports in Albany and Coeymans and with local manufacturing and supply companies interested in Off Shore Wind (OSW) production, as well as engaging domestic and European developers and supply chain companies looking to establish operations in the US market. Participated in a NYSERDA Technical Working Group on OSW and attended a NYSERDA executive session with OSW leaders from the United Kingdom to ensure regional representation and focus on workforce development and supply chain investment at regional ports and with regional manufacturers. Attended a NYSERDA OSW Supply Chain Forum where we met with leading developers looking for connections to NYS manufacturers and fabricators who can support OSW development. Attended the PowerGen show in Orlando to build awareness of regional supply chain and sites for cleantech power projects including energy storage, solar and OSW. Participated in SEMICON Europa with the SUNY Polytechnic Institute, Empire State Development and other upstate partners under NY Loves Nanotech to position the region for additional investment in industry R&D, commercialization and production. Participated in a Business Connection Forum event at SEMICON Europa to continue efforts to connect European and US companies to new opportunities in semiconductor supply chain as well as other fields. Hosted the GSA Silicon Summit East in October, attended by more than 150 regional and industry leaders, in conjunction with Saratoga County Prosperity Partnernship, Global Semiconductor Alliance and other regional partners. Joined with the SUNY Polytechnic Institute and regional partners to conduct meetings with leading tooling and device manufacturing firms in California as part of our attendance at Semiconductor Industry Association Annual Dinner. Attended with the Rensselaer Polytechnic Institute the Montreal International Game Summit (MIGS) to explore market opportunities to recruit and expand growing regional hub. We are happy to welcome Capital Financial Planning and Sunrise Realty, Management & Consulting to our list of vetted community resources for our new hires. 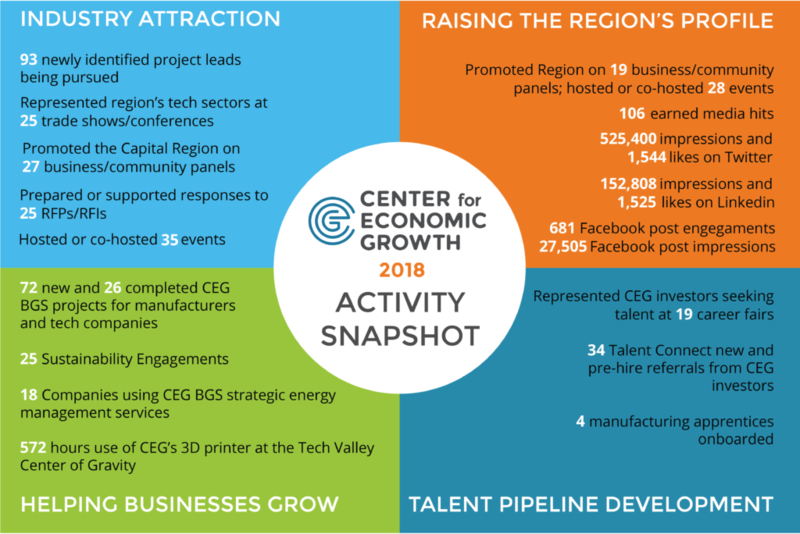 Having a relationship with Talent Connect is an effective secret weapon when it comes to attracting top talent to the region. The Service allows relocating professionals and their families to quickly build the professional networks and personal support systems that many individuals are reluctant to leave when considering a new job. Everyone likes to feel like an insider; Talent Connect helps relocated professionals and their families become insiders quickly! Also, CBRE and Fusco Personnel referred new hires to Talent Connect in Q4 and during this time we have supported over 25 new hires and two high level, pre-hire candidates with guidance, community resources and acclimation, cultural transitioning, career support services to spouses/partners, and guided city tours.